Having a fox adopt you is fun, especially if you are a wildlife photographer. This fox seemed to enjoy checking out stumps and logs on my property. I live about 100 yards from Cascade Lake and there is a large area of public forest that runs along the lake for about a mile next to my property. There are white tail deer, foxes, porcupines, raccoons, and assorted smaller animals like squirrels that make their homes here. Ospreys eat fish in a large tree nearby and an occasional bald eagle lands there also. 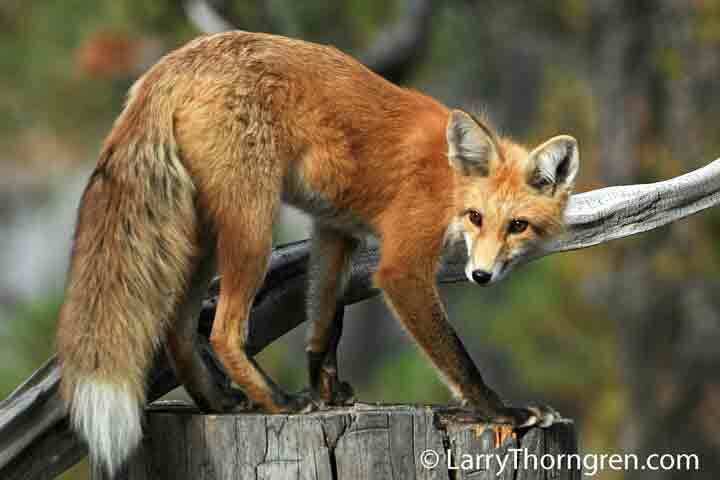 This fox is starting to grow a winter coat, which seems to start with the tail and then covers the rest of the body. This fox will appear to be much larger after it gets fully covered with long winter length hair.